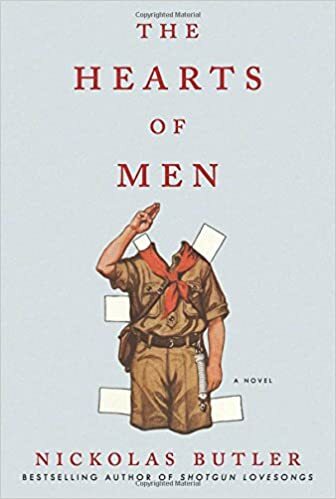 Butler's novel The Hearts of Men follows Nelson Doughty from the age of 13 until his old age, always connected with Camp Chippewa near Au Claire, Wisconsin. The book starts in 1962 and ends in the future, split into different sections in different decades, so we see how Nelson's life unfolds. When he is a boy, he is distant from his peers, all too keen to attain merit badges and live by the code of the Boy Scouts. His father beats him and his mother, and the boys at camp bully him. He is miserable. But his training will prepare him well for the army, and he will end up serving in the Vietnam War. After returning from the war, he takes over the running of Camp Chippewa, still a lonely figure, but much more self-assured than he was as a boy, yet haunted by the horrors of what he saw and did when he was a soldier. In later years, we see him in his final days of running the camp, still wise and compassionate, vigilant about the failings of other men, and determined to do the right thing. Nelson is compared with his peers, who live more regular lives, popular as boys, getting married and divorced, with jobs that provide a good living. They cheat on their wives, get high, and break social rules when they think they can get away with it. They go to the scouting camp but they don't buy into the ideals of honor that the Boy Scouts promote. Not even Nelson's father and grandfather actually live up to the ideals they insist on. So Nelson is alone in devoting himself to the moral rules he learned as a boy. While he pays a price for doing so, he also gains a rare integrity from it. It's a long book at 400 pages, 12 hours in the unabridged reading by Adam Verner. Verner's performance is assured and energetic. Butler's language is both accessible and rich, and the dialog flows well. The characters are rounded, with characters strengths and flaws. Although the subject matter of the scouts is quirky, the background issues of war and civilian life are morally serious, giving the book a welcome gravity. The themes of honor and patriotism are old fashioned, but Butler makes the story interesting enough, with plenty of contemporary themes, to make it memorable.